Yes, you read that right. Cinnamon. Bun. Popcorn. I KNOW! So simple, yet so genius. I realize people have been doing all kinds of pimped up stuff to their popcorn for ages, so I thought I’d seen it all. Frankly, I’m disappointed that I didn’t think of something so obviously delicious myself. And the best part is you probably have everything you need to make this already in your kitchen — just in time for the Oscars tomorrow night! I first heard of the food blog Lauren’s Latest when my friend Kristan pinned some of her sinfully good looking Garlic Cheesy Bread on Pintrest and it showed up on her Facebook feed (more on that subject later…perhaps). 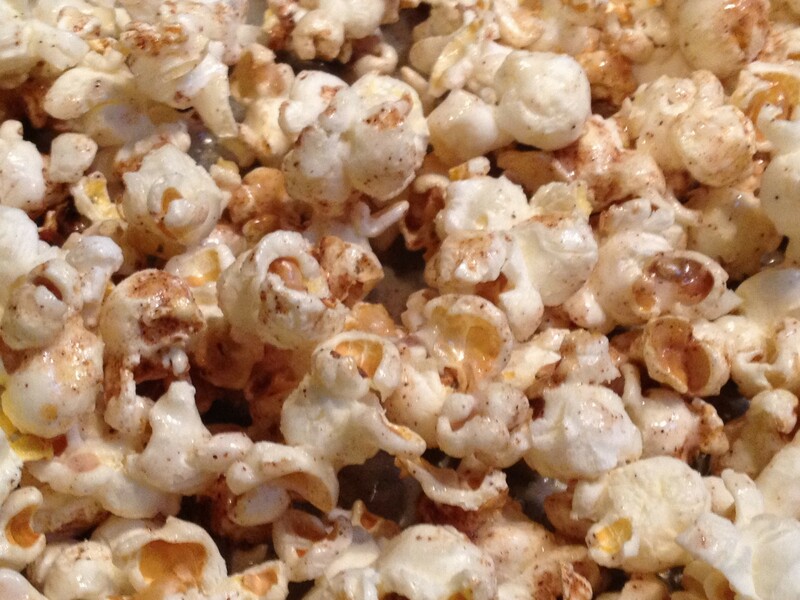 Then today, less than a week later, Fine Cooking posted Lauren’s recipe for Cinnamon Bun Popcorn on its Facebook feed. Could Facebook be conspiring with the universe to make me fat? And, if so, should I blame cute little Lauren? She looks so harmless, but, oh, these recipes! My only advice with this recipe would be to double it. Make the popcorn however you feel like making it. Like Lauren, I do it on the stove top. Unlike Lauren, I try to use coconut oil, since I think it’s healthier. But pop your corn however you wish. I have a major aversion to stickiness, but this popcorn was so good that I managed to push my issues aside and eat more than my fair share. I have a feeling you may do the same. In a small bowl, mix butter and cinnamon together. Set aside. In a separate small bowl, mix powdered sugar with half & half until smooth. You may have to stir in a little more half & half to get it to drizzling consistency. Set aside. Place oil and popcorn kernels into a large pot. Cover with tight fitting lid or foil. Place pot over high heat. Shake pot back and forth over hot burner to heat kernels evenly. Continue shaking the pot until the popcorn starts to pop. After a minute or two, the popping will slow right down and you’ll have a pot full of popcorn. Dump the hot popcorn onto a baking sheet and drizzle with cinnamon butter immediately. Stir to coat. Drizzle the icing over the top and toss to coat as well. Serve warm, or let it cool so the icing can harden up a bit. Recipe notes: It’s important to keep the pot moving the entire time its over the heat–this ensures the kernels don’t ever burn. This entry was posted in Appetizers, Desserts and tagged cinnamon bun popcorn, Oscar snacks, popcorn by Mom Mom's Apron. Bookmark the permalink.